"Easy", especially during the fast-paced holidays, is always appreciated! 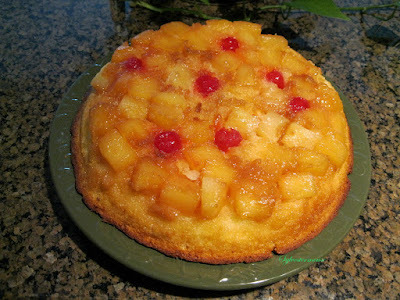 This pretty pineapple upside down cake is different from the traditional recipe because I used pineapple chunks instead of pineapple slices. It was actually quite by accident that I tried this because I didn't have any pineapple slices on hand, but we wanted to make a pineapple upside down cake. So, my sister and I improvised. Cherries are always used on this type of cake, but the maraschino cherries added just the right touch of Christmas red to our holiday cake. By placing it on a green serving plate, it made it even more festive. Sometimes, it really is all about presentation and timing. Everything in this cake was store bought, even the cake mix. I used a white cake mix that I had on hand for emergencies. Grabbing what I already had in the pantry and in my refrigerator without consideration of age, my sister and I quickly threw this cake together. It truly was the very best Pineapple Upside Down Cake I have ever eaten! It was fun to toss everything together and serve a delicious dessert to my family. From now on, I will be using this special recipe. However, I'm not sure where to buy hardened brown sugar or aged cherries. Guess I better buy them new today and plan ahead for 3 years from now. Seriously, I am sure the cake would be just as good, if not better, with freshly purchased ingredients, but you can read my whole story about the cake shown in the photo by clicking the article link below. You will find my recipe and instructions on my "House of Sylvestermouse" website. It is always fun to read about kitchen adventures like this! And I appreciate your sense of humor. Thank you! I find it best to keep laughing as much as I can over the little things. Life gets much too serious, way too often.